If you enjoy cult movies, you probably love Death Race 2000. It is still of the timeliest films ever made and is still relevant to this day. You have a manipulative shadow government, an American hero and a cast of unbelievable misfits competing for kills in a post apocalyptic America. Remind you folks of anything (wink…wink)? This kind of mad obsession with nationalism and “bread and circus” entertainment seemed outlandish back in 1975, but (only a few decades later) seems like a less -than-distant future. This seems like a no brainer, right? Why not go back to the well and update it to fit our modern times. 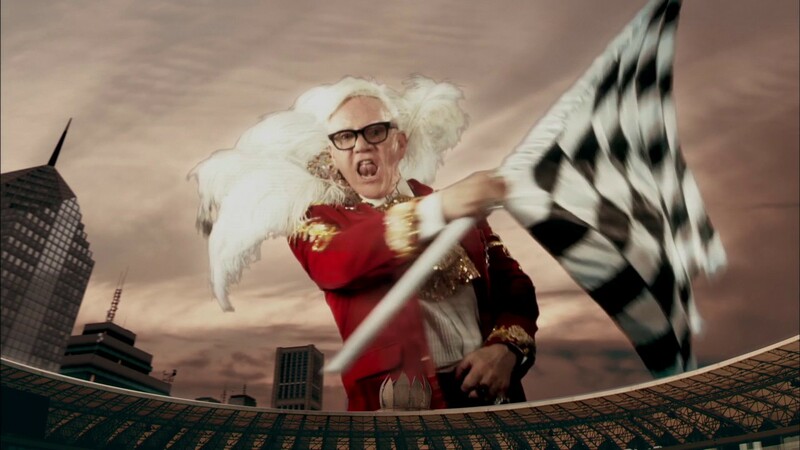 Well, that is what Roger Corman decided to do when producing Death Race 2050. 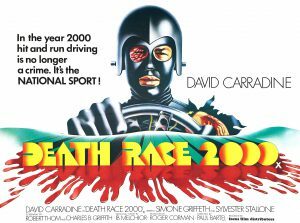 The sequel begins like the final 10 minutes of 2000 never happened and we are back to the annual (and titular) Death Race. We meet our new gang of miscreants, including a new version of Frankenstein. There is a pop star, a genetic freak and a horny scientist hop right into the killing and they compete for “murder points”. Once again, rebels plan to disrupt the race and threaten to end the event for good. The first 25 minutes of this film are exciting, loud, and really paint a great picture of what world we are visiting in this film. The introduction to the drivers is genuinely entertaining, but once they get on the road it falls apart at the seams. All of that good fortune gets lost in the film’s dedication to snarky remarks and chooses to be clever, rather than good. The unbearable smugness gives over to Sharknado territory, with constant winking and “look how cute we are being” moments. I am being tough on this movie, but there are some bright points sprinkled throughout. Malcolm McDowell’s performance is fantastically over-the-top as the villain and is still the best at what he does. The writing can be fun, especially when it takes itself seriously and there are a couple clever gags. Overall, these brief highpoints don’t make up for the rest of the film and will leave you wondering why they bothered remaking it at all. Death Race 2050 is currently available on Blu-ray, DVD, VOD, and, as of last week, Netflix streaming.